Bell Biv DeVoe was hatched in the minds of its members, New Edition’s Ricky Bell, Michael Bivins, and Ronnie DeVoe, upon the departure of lead singer Bobby Brown in 1986. But it wasn’t until after New Edition completed its supporting tour for the album Heart Break in 1988 that the trio gave in to the urgings of Heart Break producers Jimmy Jam and Terry Lewis and decided to chart its own course. Bell Biv DeVoe enlisted a variety of producers for its debut album, including Jam and Lewis and Public Enemy producers Hank and Keith Shocklee. The results were quite unlike anything in New Edition’s repertoire: The beats were funkier, the lyrics and vocals were sexier, and the overall sound had a harder, hip-hop-tinged edge. 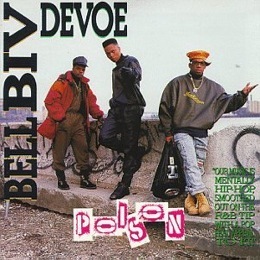 The album’s title track, “Poison,” became a number three smash, and it was followed by the equally successful “Do Me!” and the R&B hits “B.B.D. (I Thought it Was Me),” “When Will I See You Smile Again?,” and “Dope!” The album itself went on to sell over three million copies and was followed by a remix album the next year. Meanwhile, Bivins took some time off to assemble the so-called East Coast Family, discovering and producing debut albums for Another Bad Creation and Boyz II Men. Hootie Mack, Bell Biv DeVoe’s second proper album, was released in 1993 but didn’t make as much of an impact. In 1996, all three members of Bell Biv DeVoe participated in a reunion of New Edition.